After a slight delay, a few fond farewells and the mandatory game of hunt the car keys we left Biggin Hill, family, pets and England on the 21st August 2010. The journey to Dover was well spent with Megan trying to catch me out with things that I had forgotten to pack, which ended one nil to her when it emerged that I had indeed forgotten our rather nice camping lamp. Never mind, I’m sure Mr Carrefour will have one for us. An uneventful ferry crossing was followed by a 7 hour drive to Dijon. Lesson one: although the GPS says the journey will take 6 hours a 4 tonne 1996 Land Rover will be unable to maintain the 130kph required to achieve this, so always add a third to all GPS times. We have a budget of around 60 pounds a day which, with all the petrol, tolls and ferries of the first day has resulted in us not being able to eat, drink, camp or drive for the next 5.3 days in order to make up for the outrageous over spend of yesterday. Megan will be adding a spreadsheet to the blog in the near future so you have an idea of the cost involved in doing a trip like this, something we have found very useful from other overland blogs. 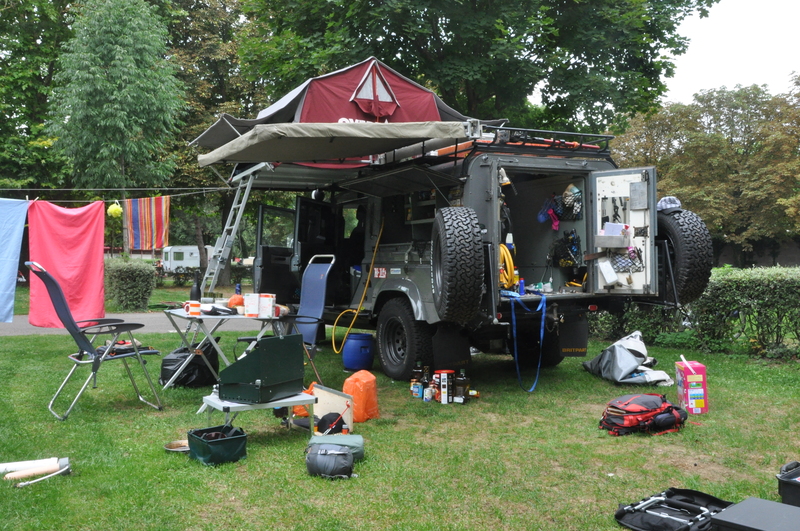 Lesson two: Although it’s 12 degrees at 0500 in London by 1400 in central France it’s 32 degrees outside and 35 inside a Land Rover, so don’t pack your shorts under liters of WD40 and gear box oil. We arrived at the campsite in Dijon at 6pm and luckily got the last pitch. Up went the tent, and the admirers crowded round! I say admirers because at least 4 different groups came up looking at the car and showing interest in our trip. It was great meeting these people and it gave us both a boost following the long haul we had just done. Lesson three: People seem interested in the car and want a guided tour, it’s therefore a good idea to ensure the mass quantities of toilet paper are hidden from view! So that was day one and I am writing this on day two, still in Dijon as we have spent the day repacking and sorting the car. It’s strange, I think I speak for Megan as well, but we are both experiencing mixed emotions. There is the sadness of leaving friends and family, anxiety about the massive distances we have to travel and whether the Land Rover will make it, excitement about all the amazing sights we are going to see and worry about whether all this was a good idea. I’m sure we will settle into things but at the moment we feel very much on edge. Lesson four: Attempt to relax. Looks like your having a good time so far ! If you’re heading via Chamonix I’d recommend this site: http://www.camping-mont-blanc.com its very good ! Mum is claiming to be able to track you somehow and youre now at the border of Italy if you didnt know. This kind of blows my mind a bit or mum is just playing a particular clever joke on me. Def keep up the blog Simon – makes me feel like I’m there, well kind of! I can just imagine you both with these said mixed emotions. Keep smiling and keep writing funny things and you’ll be fine. Sharing is caring. I know you know that anyway. Hello Travellers of the Universe!! Glad to see you are well on your way!! Can understand the “mixed feelings”, but the fun part is still to come!! Hope you get this message. Meg, if you get a mo, just send us an email to confirm we’re doing things the right way and not betraying our technological limitations! !.